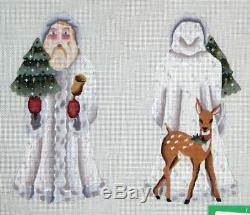 Melissa Shirley Santa & Fawn Hand Painted Needlepoint Canvas 18 ct. This hand painted needlepoint canvas is on 18 ct canvas with an approximate design size of 4 X 9. This hand painted needlepoint canvas is created by Melissa Shirley Designs 167-C. The item "Melissa Shirley Santa & Fawn Hand Painted Needlepoint Canvas 18 ct" is in sale since Wednesday, July 25, 2018. This item is in the category "Crafts\Needlecrafts & Yarn\Embroidery & Cross Stitch\Hand Embroidery Cloth & Canvas\Plastic Canvas". The seller is "miller85614" and is located in Green Valley, Arizona. This item can be shipped to United States.